You guys. I have a new love. 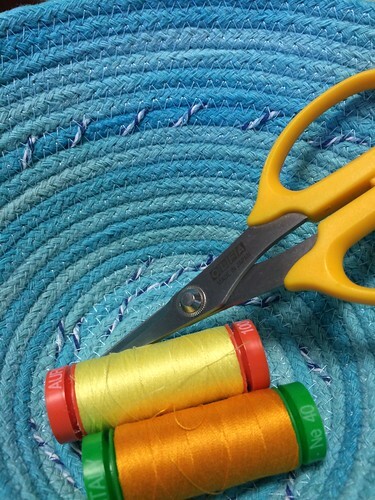 And it involves clothes line and zig zag stitches….who knew?! I’m not here to tell you how to make them. There are tons of pins on pinterest for these and tutorials on you tube. They all do a good job…so just go find those. 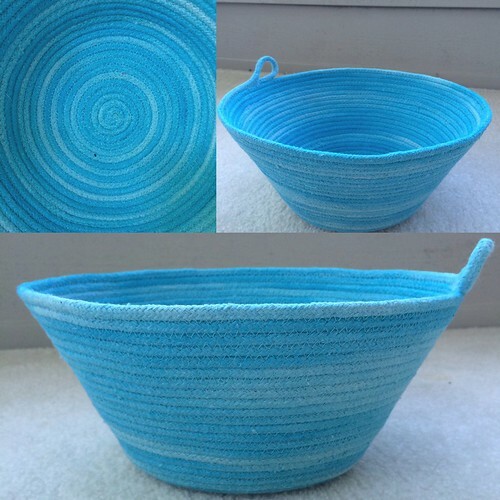 Try searching under coilbaskets or ropebaskets or ropebowls or fabric bowls etc. You’ll find them. The white basket above is the first basket I made. And I love it. Seriously. Instant fall in love perfection. I’m aiming to keep mine simple for now. I thought I would want to wrap these with fabric because I was seeing some fabulous bowls being made that way. And maybe I still will. But for now I’m really enjoying the texture of the rope. FYI: the rope I use is clothesline rope that I buy at Joanns. It can be found in the notions aisle near the ironing supplies. It wasn’t long before I found myself already wanting to change things up a bit. One bowl in and I was full of ideas! So I found myself dying for the first time. I was happy with how my cording turned out but I’m already ready to try more dying techniques. I just got back from purchasing more cording and two dye packs to see what else I can do. This bowl was quite large for me and for my third attempt I wanted to try a smaller one. 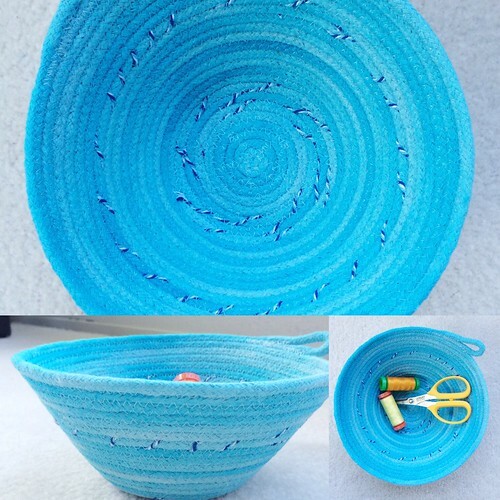 So I broke into my pretty ombre blue cording again and made another bowl with some little accents. It’s the perfect size for holding those little notions while sewing! And here is a closeup of the cording and the zig zag stitching. 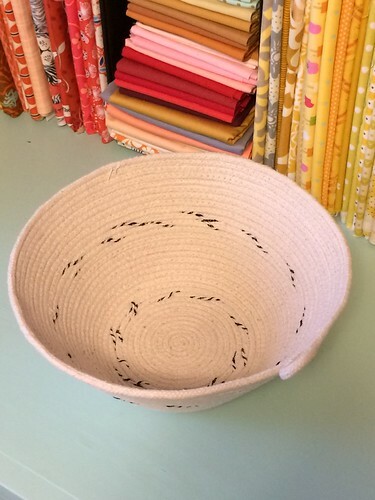 These bowls take a good amount of thread, so don’t be surprised if you have to refill your bobbin for some of the larger ones. 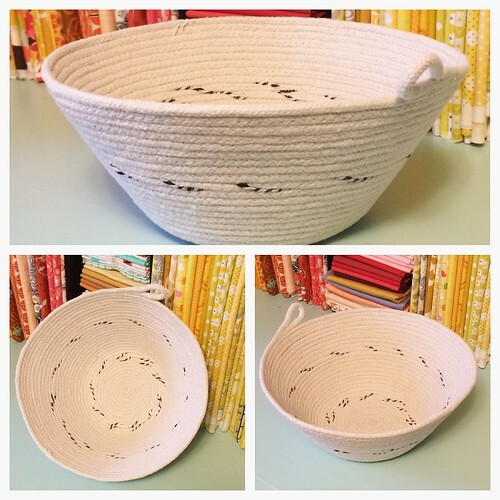 I have my rope, thread, sewing machine and ideas at the ready to make rope bowls. Now all I need is the time. LOL For now I will enjoy my bowl making vicariously through you. It's great you are enjoying the new hobby and exploring ways to expand your creativity. I AM enjoying it! It's been great to try something new that is so immediately gratifying. Lovely! I like making ones with oval bottoms too, or flat ones to use as trivets. Very cool! Was the dying hard? I've never done it. I had never done it before either! I just followed the directions on the package and seemed to do alright. But I still feel like I have a lot to learn on that end. this is on my "must try" list! 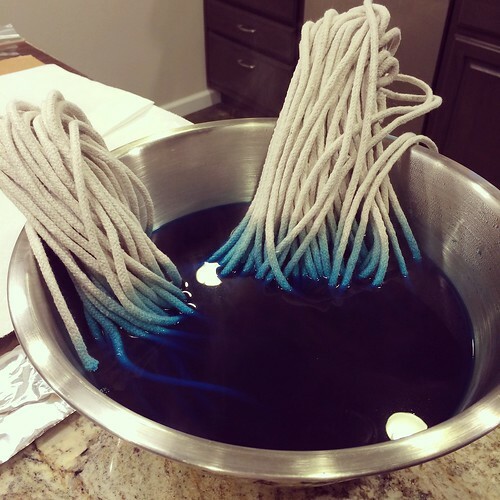 I have been pinning instructions for awhile now, but havent actually tried making any yet. Yours are beautiful! I love the design you used and that blue is perfect! I ran a 1/2marathon today & passes some time thinking about your baskets which i read about before it started. It put a smile on my face. Thank you! You should try it. It's addicting! these are lovely, I just finished two last week with left over binding strips. have a look on my blog. I really want to make one of these! I've seen so many variations and you can do so much with them. Yours look so pretty! Thank you! I looked at a bunch of examples and am just winging it. It's fun to be creative like this. Super fun and if you have a Big Lots or Dollar store the rope is super cheap and good quality. I have a collection of these bowls, but, I have yet to make one myself. I did get to watch a lady making them, a few years ago.